We went to Great Lakes first. It was bustling by the time we got there, but the kids happily ran around chasing pigeons while we waited to be seated since they had spent most of the morning in the car. The food was good, but Eliza was hungry and wanted to be held and entertained, so it was a bit exhausting. But we did have a great meal, good beer, and a nice spot for outdoor dining and people watching. From there, we hit up the Cleveland Zoo, which was pretty nice. Great exhibits, lots of animals, and informative signs made for a nice afternoon. Ruby desperately needed a nap (resulting in the Great "Mommy Will Not Carry You, Walk Or Ride in the Wagon" Standoff of 2014) but other than that it was a lot of fun. At that point we were all pretty tired, so it was back to the hotel where we ate pizza and attempted to sleep. In the same bed. I just needed to point that out again. The next day was super fun. We got brunch at a different brewery. (Market something? District Brewing maybe?) Then we headed to the Natural History Museum. We had talked up the dinosaur bones to the kids, but they were not really impressed. Ramona's favorite part was a display of a bunch of animals watching a TV with the world's "most dangerous animal" which just showed footage of you standing there looking at the display. Ramona was delighted to be on television despite the stuffed animals obvious appall at her inherent danger and kept finding ways to wander back to the exhibit. The cutest moment was when the big girls decided to spontaneously hug and then hold hands as they walked around together. We got a lot of pictures together. For this one, Joe told us to roar. Ramona and I got really into it. Ruby did not. Eliza wondered if there was a way to pretend not to know me when she was strapped to my chest. After that we decided to take the little girls to their first National Park (and Ramona's third.) 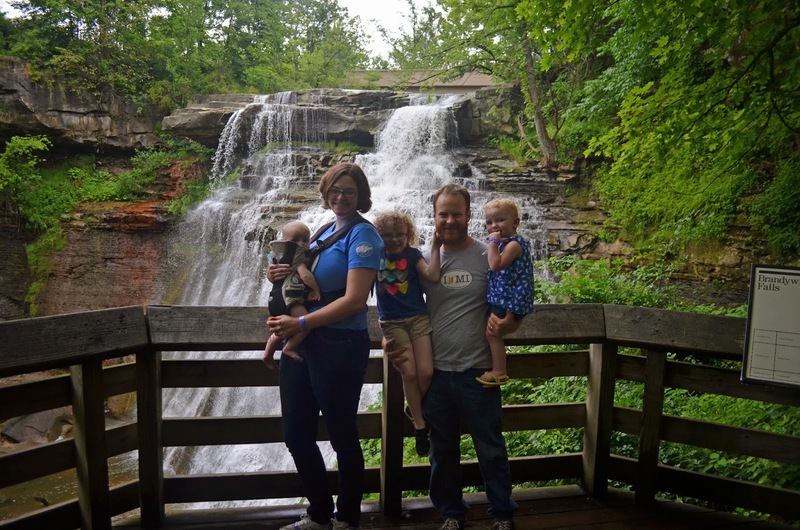 So we went off to Cuyahoga Valley National Park, specifically to Brandywine Falls. It started pouring rain as we pulled into the parking lot, but it died down to sprinkles by the time I had fed Eliza and we got ready to walk off to the falls. The kids were completely nonplussed. I thought at least Ramona would be impressed, but no. Eliza seemed to like the noise better than her white noise machine at home, so I guess at least one of them liked it. There was a friendly guy down there with his wife and we talked to him a bit and he offered to take a picture of the whole family, which was awesome since we don't have many of those. You could view the falls from the top as well, so we went up to go check that out, and as soon as we got a few feet down the boardwalk it started POURING again. Ruby found this to be hilarious, and it was kind of fun. It was one of those things where there's nothing you can do but just keep walking, so we were all dripping wet and laughing. And as suddenly as it had started, it stopped. We got back to the car, changed into some dry clothes and drove back home. It was a short trip, but a good time. The kids are such good little travelers and I love seeing everything through their eyes. I think we'll find out way out to Cleveland again soon. There are definitely more adventures to be had there.